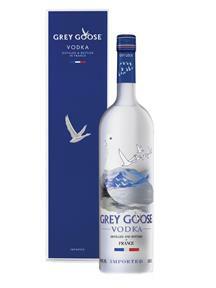 Grey Goose was created to be the World's Best Tasting Vodka. The origins of Grey Goose lie in the Cognac region of western France, a natural home for the World's Best Tasting Vodka. Grey Goose is the only vodka that calls on the expertise of a Maitre de Chai, or Cellar Master - a man named Francois Thibault. His skills help bring out the very best from 100% fine French wheat from La Beauce, a five-step distillation process and the artesian spring water naturally filtered through Champagne limestone - the elements which come together to produce a vodka which captures the essence of the region. The aroma is rounded with a hint of sweetness. The taste is lush and smooth, buttery and rounded, and melts in the mouth with a long lasting satisfying finish.